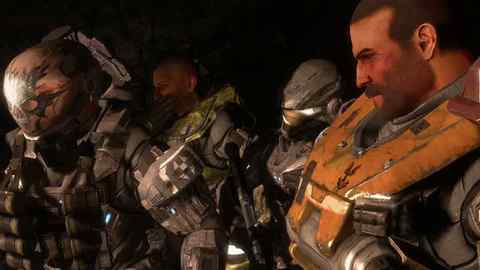 Since the announcement, Bungie's kept schtum on what its next big action game universe actually is, concentrating instead on bigging up upcoming Xbox 360 exclusive Halo: Reach. But that didn't stop us from asking campaign designer Niles Sankey and community director Brian Jarrard about the deal and a whole lot more besides at a preview event in London yesterday. Oh, and have we mentioned Halo 4? Eurogamer: You've said Reach is your last Halo game. Now it's nearly out, do you feel any tinge of regret? Do you wonder whether you've made the right decision? Brian Jarrard: I've spoken with lots of people on the team. It's something we talk a lot about. Honestly, because we haven't released the game yet, I don't think it's fully sunk in for the majority of people. People are just happy that the hard work is now behind them. Personally, it's not going to be until a couple of months out when we start to realise we're done working in this universe and this space. I don't think there are any regrets, though. I have never heard any sentiment of that. There's a sense of pride and accomplishment for not only creating such a rich universe to be able to persist for so long, but feeling truly that we've built our best Halo game yet. Niles Sankey: In many ways we don't feel done at all. We still have the best part about game development, which is releasing it to the public. It's always the most exciting part. Especially with things like the new Forge and Forge World, we still haven't experienced the full Halo: Reach ourselves. Once we release it we get to see what the community does and how they contribute. It's so exciting. Eurogamer: Why tell the story of Reach? Why not continue Master Chief's story? Niles Sankey: Obviously the Master Chief story is cool in its own right. But with the Master Chief's story, he's the last Spartan. We wanted to see what is it like, back in the day before Master Chief, when there was a huge Covenant invasion and you had armies of Spartans and squads of Spartans engaging the huge army and invasion of the Covenant. This is a good story in which we get to the high point or epicentre of the full-on battle. So we were like, "Yeah, we gotta do that.'" On top of that, it does tell part of the story of the Chief. People do like to see how this all came to be, and how this story leads in, and how does Noble team impact the story of the Master Chief? Brian Jarrard: There's something nice and poetic about ending our 10 years of Halo by going back to where it all began. And by being a self-contained story, too. We've mentioned this before: the first discussion we ever had at Bungie started with, "OK, well let's discuss what Halo 4 might be and what could that entail?" But it quickly became potentially way more than we could fit into a single game and do it well. It obviously brings forward a lot of baggage with it, too. If you're not familiar with all that's transpired before it, is that going to be a great experience for players? Going back to Reach, the events on that planet and that turning point in the war are beloved by fans. It's an exciting point in the universe. Everything aligned to make it compelling for our studio.